SEACGP member's show their pride! Don't see your pictures here? Scroll to the bottom. 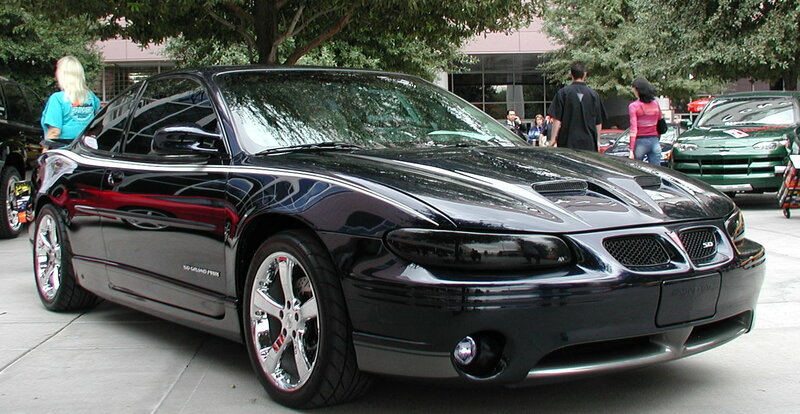 William Bruno's 2002 Blue Black Metallic GTP Sedan. William is from Everett. Heather De Wall's stock 1998 Bright Red GTP. The proudest moment so far is pulling a 14.685 in the quarter mile with no modifications! You can find Heather cruising around in Beaverton, Oregon but this car is no longer stock. Bob Alexander from Maple Valley has a beautiful '99 White/Platinum Regal GS. Steve Chick's black GTP shines in the sun. Steve leaped past most of the SEACGP membership in dragstrip times this past year. Will he make the final leap in in the year to come? Our youngest AND most enthusiastic member, Kyle Legere from Surrey, B.C., proudly shows off his 1998 Dark Forest Green Metallic GTP Sedan! This '97 Regal GS belongs to Steve Case of Auburn, our club Vice President. Steve runs the GS in rallys and when the speed limiter hurdle is cleared, road races in Nevada. Steve has learned to love more than open road and rally racing since overcoming the speed limiter on a '97 GS is a problem and is a regular competitor in Car Club Challenge and the owner of the quickest GS in our club. This Rare '89 Turbo Grand Prix (built by ASC Inc. and McLaren Engines, Inc., it is one of 3725 made in '89 and 3750 made in '90) is owned by Jim Walterscheidt, and is a daily driver up and down the I-5 corridor! Jim now owns 4 different Turbo Grand Prix models. Note: The second photo is Jim paired up with Doug Mill at Bremerton's 2nd Annual BUICK - OLDSMOBILE - PONTIAC Drags on September 18th, 1999. Russ Ellman, SEACGP President, has one HOT GTP! Russ is currently our most successful Car Club Challenge racer having been to the semi's a few times and winning a Bremerton event in 2001. Amazing to think we had to prod him into racing his GTP a couple years ago, he's hooked now and one of the most consistent racers in our club. Tim Morris from Federal Way can be seen at SIR often in his Black '97 GTP Coupe. When the smoke clears and he can escape work, that is! Those of you who follow the Grand Prix Net mail list know RC 'Pit Bull' Mitchell as one of the GURUs of the pack. He is also an avid racer and can be found at SIR, if you look quick! Mike Johnston is the proud owner of a '96 Dark Teal Metallic 2 door SE Grand Prix. Watch for him cruising in the Lacy area! Doug Mill from Bellevue has a '98 Buick Regal GS. He also has a few other cars that tear up the track, check out his Fly-N-Box, '57 Chevy and Z3 ///M coupe. Mike Lewis's neighbors in Issaquah have always thought he has the shiniest car around (must be the Zaino!).. But he couldn't keep his secret, he told them he traded in his '97 GT for a '99 GTP! Both cars are bright red sedans, who would have known!?! Mike has a slightly ;) outdated web page here. 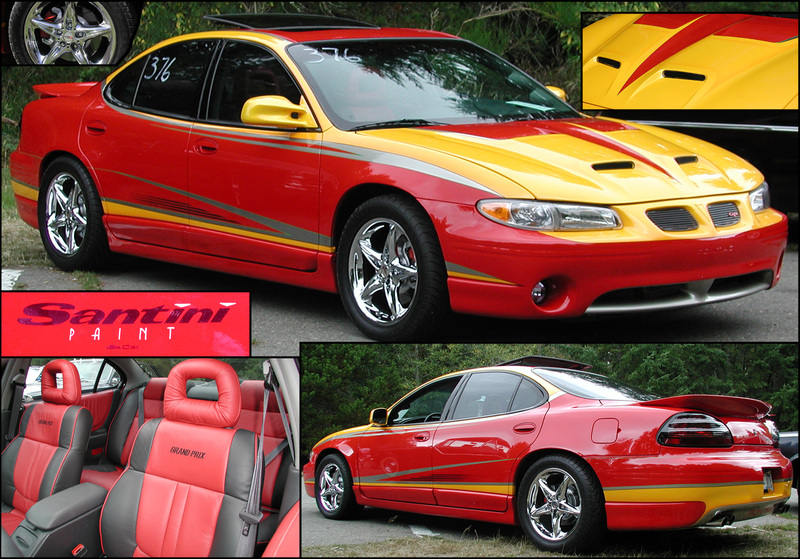 There is an updated picture of his '99 with a wild new Santini paint job here. And a picture of another GP (coupe) he has here. Would YOU like to have your car featured here? Then be an active member of the SEACGP and send your images to the webmaster. Did your pictures disappear? Probably because you've abandoned us, aren't active anymore or never have been. If we haven't heard from you on the mailing list or seen you at a club meeting for awhile (like within the last year) then you are assumed to be no longer a member.